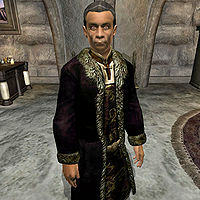 Janus Hassildor, an Imperial noble, is the Count of Skingrad. If you talk to the locals, they will mention that he is rarely seen in public. Most people in Skingrad seem to believe that Count Hassildor is simply a bit crowd shy, but upon meeting him, the true reason is evidenced by his gaunt face, pronounced cheekbones, and fierce red eyes: the Count is a Vampire. What makes him even more unique is his opinions on other vampires. He dislikes them, claiming that they have given in to their animal urges. Other vampires are a problem for Hassildor, as they often take up residence around Skingrad. This attracts Vampire Hunters who often ask unwanted questions, which leads to the Information at a Price Mages Guild quest. Hassildor's wife, Rona, is also a vampire, but has not been able to come to terms with her condition. His life as a vampire is a lonely one and Janus Hassildor lives an isolated existence inside Castle Skingrad. Because of the suspicious behavior of one of his stewards, Mercator Hosidus, Janus will, at the beginning of the game, wander restlessly around his quarters in the Lord's Manor 24 hours a day, without ever eating or sleeping. The highlight of the day is a brief visit from trustworthy castle steward Hal-Liurz between midnight and 2am. After the Ulterior Motives quest is completed, the Count once again feels safe. With a lot of sleep to catch up on, he will rest in his bed for a good twelve hours starting at 6am; and will only leave his quarters when Hal-Liurz fetches him during various quests. There are several exceptions to this schedule. Please visit the Quest-Specific Events section for details. 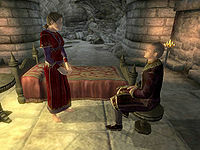 As a count, Janus treats himself to the best clothing Cyrodiil has to offer: a black & burgundy outfit coupled with a pair of gold trimmed shoes and a leveled piece of precious jewelry. He also carries the key to the Castle, the one to the Lord's Manor and up to 25 septims. Being a vampire also entails some advantages; in Janus's case, he will benefit from all of the attribute and skills of 50% vampirism plus all of the vampiric spells but Reign of Terror. As a downside, he will also suffer from all of the weaknesses of a 50% vampire. When you meet him for the first time, outside of the related quests, he will be reserved and introduce himself briefly: "I'm sorry. We've not met. I'm Janus Hassildor, Count Skingrad." 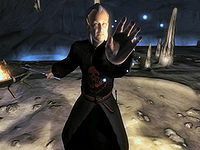 When asked about Skingrad he will point you towards Hal-Liurz with the words: "Perhaps you'd better speak to my steward. I'm afraid I have little time to spend with visitors to Skingrad." If you ask him about Chancellor Ocato, he'll admit: "I don't envy the High Chancellor his position. It can't be easy trying to rule an empire without an emperor." "The Count of Skingrad and I are not social intimates. In fact, I don't believe Janus Hassildor has any social intimates." "A master sorcerer like Janus Hassildor inevitably outlives all his peers. It must be a lonely existence." "I suppose Count Hassildor keeps Skingrad running smoothly, but you hardly ever see the man." "I've heard some strange stories about Count Hassildor. I'm sure they couldn't be true, though." "It's curious. Skingrad's people scarcely ever set eyes on the Count, but he's apparently loved and respected by all his subjects." 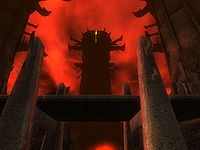 With the Oblivion crisis going full force all over Cyrodiil, it becomes apparent that Bruma will need reinforcements from the other major cities in Cyrodiil. You will have to ask his steward to fetch the Count so you can ask him for help. He will, after a while, come down to the County Hall, but will be unwilling to help Bruma as long as the Skingrad gate is still open: "While Skingrad is threatened by an Oblivion Gate, I cannot spare any soldiers for Bruma. Whatever you may think of me, I still protect my own. This is my city, and Mehrunes Dagon will not have it while I remain Count of Skingrad." 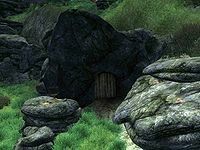 When asked about Skingrad at this point, the Count will demonstrate just how dedicated he is to his county: "Believe me, Mehrunes Dagon will know he was in a fight if he tries to take this city from me." After you have closed the gate, the Count once again enters the County Hall to congratulate you and offer his help in the battle for Bruma: "Your bravery is the talk of Skingrad. Well done!" He will also reflect for a moment before agreeing to help out: "Mehrunes Dagon has no more love for my kind than for my mortal subjects. Less, perhaps, as we make poor slaves. You have helped me by closing the Oblivion Gate near Skingrad. I will likewise help you by sending aid to Bruma." He will then return to his quarters and his usual lonely existence. After you have been infected with Porphyric Hemophilia and you have turned into a vampire, Mages Guild Master-Wizard Raminus Polus will, when approached about a cure, point you towards the Count with the words: "Count Hassildor of Skingrad has done the most recent research on a cure, I believe. He has what you might call a vested interest in the subject. I suggest you travel there, and seek an audience with him. Given your condition, I believe he may assist you." After Hal-Liurz has fetched him, Janus will appear in the Castle Hall and say: "I understand you're looking for a cure for vampirism. This is fortunate, as I also seek the cure." When you ask him to elaborate he will tell you the sad story of himself and his beloved wife Rona: "I wish to tell you a story so that you might understand why I would trust you with my secrets. More than 50 years ago, my wife Rona and I were both turned into vampires. While I came to embrace the changes in myself, she did not. She hated what she had become, and refused to feed to keep herself healthy. She eventually slipped into a coma from which she has not awoken. My trusted servants have cared for her all this time, but I wish for her to at last find peace. The cure is for her. I have researched what I can, but acquiring the cure is beyond my grasp. I cannot risk drawing too much attention to myself. So I would ask that you took up the search on my behalf. If you are successful, I will reward you in whatever small way I can. Will you aid me?" The answer is obvious, so he will continue: "What little I have discovered points to the witches of Glenmoril. In the past, they have been capable of creating a cure. I have searched for these witches throughout Cyrodiil, but no covens still exist within its borders. There may be one left. I have unconfirmed reports of a woman seen near the Corbolo river, who fits the description of these witches. Seek her out, and learn whether she can help. She lives somewhere along the river, east of the Imperial City and south of Cheydinhal. If you are successful in finding a cure, report to my steward. You have my thanks." "I've come to give you peace at last." After Rona has found her peace, a seemingly touched Janus will tell you: "My wife... my beautiful wife. Now is not the time for discussion. Give me a day's time to set her affairs in order. Speak with Hal-Liurz tomorrow. Please. Leave me to my grief." After 24 hours of grieving, Janus will welcome you and thank you for your help: "It is good to see you again my friend. I cannot thank you enough for helping me rescue Rona from the terrible state she was in. I hope that she has found the peace she sought. I'd like to offer you a reward for your efforts. It seems you'd been cured of vampirism yourself, so I can offer no help in that regard. I can, however, present you with a sum of money. Thank you again. I shall rest easier now, knowing that Rona no longer suffers." During the ambush in the West Weald lead by the treacherous Mercator Hosidus and his two necromancer companions, Arterion and Mondrar Henim, the Count will make a surprise appearance and aid you in the heated battle. Once all three necromancers have been slain he will approach you and angrily say: "You impossible fool. What possessed you to think I would suggest a meeting here, of all places? At least your gullibility served some useful purpose. I knew about Mercator, but not his friends. Now none of them are a threat any longer." When you ask him to introduce himself he will do so: "Count Janus Hassildor, at your service. A 'thank you' might be in order at this point." When you question him about Mercator he will ask you a question: "Do you not recognize a Necromancer when you see one? I suspected Mercator was involved in their cult, but was unwilling to move against him without knowing the identities of his allies. Despite what your Council may think, I've not thrown in with the Necromancers, and would never do so. You may pass along that message." When asked about the book for the Guild he will reveal the truth: "Is that so? Perhaps your Council has not been entirely honest with you. Do you really believe they sent you here for a book? No, they sent you to spy on me. They've heard the same rumors I have about the Necromancer's Cult." If you demand the book, he will get angry: "Would you dare make demands of me now? And a book, of all things. Your gullibility knows no bounds, it would seem. You believe your Council would send you here to merely fetch a book? No, they wanted information on me and what is going on here. Well, now they shall have it." And he will continue: "Tell your Council that the next time they want something from me, they come themselves. They don't send someone under false pretenses." When you reckon that you were unknowing about the Guild's goals he will be forgiving: "Yes, I see that now. I regret that Traven has involved you in this way. At least you've survived... for now. Perhaps in the future, you can be trusted enough to deal with more serious matters. Now, our business here is concluded. I suggest you return to your Council." He will then proceed to leave, and if you approach him again he will just say: "I've said all there is to be said. Trouble me no more." After all this, Janus Hassildor will return to the Castle and his usual routines. After the successful outcome of the Ulterior Motives quest, Janus Hassildor will make a request to the Mages Guild to send you personally for this next task. As it turns out, he will only trade his valuable information if you do him a favor: "Welcome, guild mage. We meet again, although in different circumstances. I fear this time you may find the results no more to your liking than the last. Less so, perhaps. The information I have for your guild will not be met with smiles and hand-shakes, I fear." When you ask him about the information he will say: "I have called you here because from our previous encounter, I believe you can be trusted. Consider the implications of that, as you handle a small matter for me. Surprised? Nothing is for free, mage. There is a small nuisance I would have you deal with before I tell you what I know. One good turn deserves another, after all." If you question him about handing over the information now, he will say: "And miss the opportunity to take advantage of your help? I think not. I assure you, the information I have will be worth your time." He will then proceed to describe his problem: "It is a minor situation to be sure, but neither I nor my guards can become directly involved. A nest of vampires has sprung up in Bloodcrust Cavern, southeast of the town. They are a threat to the town, and must be eliminated. 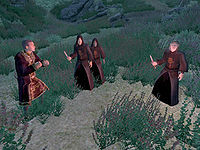 Their presence has drawn a group of vampire hunters to town, following rumors of 'vampires in Skingrad.' While I do not believe my identity has been compromised, I do not wish to take any chances, and so cannot act on either matter. You, however, can act with impunity, and so will take care of this for me. Then I will tell you what I know." He will even describe the Cavern for you: "The cavern is a short distance east of the castle. Far enough from town that few residents have reason to pass by it, thankfully." When asked about the vampires, he will share his true opinions on his own kind: "I assure you, I am not responsible for them. I would never be so careless. Where there are mindless animals, predators are never far behind. This is not the first time such a thing has happened, however. On some level, they're aware of my presence. Whether they covet all that I have, or simply wish to see it destroyed, I do not know. They have given in to their instincts, and are little more than animals. They need to be exterminated, one way or another." If you ask him to identify the vampire hunters he will try: "There are at least three of them. I know only one by name: a wood elf called Eridor. He's rather good, from what I understand. I could handle them myself, but it would be... unwise to display my prowess in public. That is the folly of the young and proud. Of course, should you be caught murdering them in the streets, the guards will respond accordingly. I can't be connected with this, remember?" When you ask him where to find the hunters, he will say: "This I cannot say. I have refrained from expressing too much interest, lest their attention be turned towards the castle.The citizens will likely know more. I imagine many have noticed their presence here." He does not really care how you deal with them either, as long as you get rid of them: "Kill them, run them out of town – do what you will. I simply want them gone. Of course, should you be caught murdering them in the streets, the guards will respond accordingly. I cannot arouse further suspicion by offering leniency to you, should you find yourself on the wrong side of the law." After you have dealt with both the vampires and the hunters, he will be quite satisfied: "So the work is complete. Now we can discuss the information I have for you." On the topic of Bloodcrust Cavern he will simply say: "The Cavern is silent once more. I would be foolish to think that this might send a message to those who would encroach on my territory." And if you chose to convince the hunters to leave, he will remark: "You convinced them to leave, I see. A wise plan. More hunters will come in time, I am sure. For now, Skingrad is quiet again, and you have my thanks." When he finally gets to the important information, he will hint at terrible things to come: "Your guild does not fully appreciate the danger which quickly approaches. Hopefully when you return to them, their eyes will be opened. The Necromancers are a sign of things to come. An old acquaintance of the guild has come to Cyrodiil, and they are answering his call. While I do not know for quite what purpose he has arrived, I believe the Guild of Mages is in great danger. Mannimarco has returned. Nearly invincible, he has established himself somewhere in the north of Cyrodiil. This is all that I know. See to it that your leader, Traven, learns this as soon as possible. I have no love for your guild, but I have no wish to see it destroyed either." and "I have told you all that I know. Mannimarco has come to Cyrodiil, and I believe he means harm to your guild. Traven must know this. Even I know that some from your guild have defected to join him. I believe you can be trusted, as you have been attacked once already. Perhaps it is a mistake to make that assumption; only time will tell, I suppose." If you ask him about the King of Worms once again, he will just say: "He is an old and powerful Necromancer. Traven will recognize the name, even if you do not." After this conversation, he will head out into the Castle Courtyard and enter his private quarters through the door outside. This is the only moment he ever goes outside and, depending on what time of day it is, he can start smoking. Although he is always essential, he is listed as one of the Blood Price characters for Lost Histories. "I can offer you money, of course, but given my condition, I am in a position to offer you something relatively unique. If you wish, you can become a vampire. It will be slightly painful, but far easier on you than... other methods. Which would you prefer?" "This is not a gift to be taken lightly. It may cause you harm in the long run, but at least you already know a way to rid yourself of it. Once you have the disease for several days, rest and let the effects take hold. And please, be careful. Good luck." Finally, he would cast the "Vampire Reward Spell", which would infect you with Porphyric Hemophilia. In Ulterior Motives, if you have almost completed the quest (quest stage 40, after surviving the ambush and being told the full story by Janus, but before returning to Raminus Polus to complete the quest), Janus will always greet you with "I've said all there is to be said. Trouble me no more." He will refuse to say anything else. This greeting will take precedence over all other greetings and will therefore prevent any progress in other quests. To fix the problem, you need to talk with Raminus Polus and complete the Ulterior Motives quest. In Vampire Cure, if you have almost completed the quest (quest stage 80, while Janus is grieving for his dead wife), Janus will greet you with "Please, go." He will refuse to say anything else. To fix the problem, you normally can just wait 24 hours. If he is still uncooperative after 24 hours, see the suggestions at Vampire Cure Bugs.